John Ruskin, the 19th century polymath is celebrated for his accomplishments as a writer, artist and social reformer, and it isn’t hard to see where he gleaned his inspiration from upon a visit to his home of 28 years, Brantwood. Filled with pieces of handmade furniture, the house reflects his love of country life and craftsmanship, over urbanity and mechanically reproduced products which he criticised in one of his seminal writings The Stones of Venice. We particularly love the glass turret attached to Ruskin’s bedroom, which offers unsurpassed views of Coniston Water and the breathtaking surrounding scenery. Brantwood continues to be a hub of creative activity, so watch out for its upcoming artist residencies, exhibitions and events. If you’re wandering lonely as a cloud around the charming village of Grasmere, you may stumble upon Dove Cottage, the one time home of the renowned Cumbrian Romantic poet William Wordsworth. After falling in love with the property in 1799 whilst on a Lake District walking tour, he moved in with his sister and proceeded to write some of his most famous poems (and his sister Dorothy wrote The Grasmere Journals.) You can take a guided tour of the cottage, and also view the small fell-side garden, which Wordsworth called a “little domestic slip of mountain.” Don’t miss the Wordsworth Museum next door, which exhibits the largest collection of Wordsworth’s original letters, journals and poems in the world! Fancy a bit of literature come to life? The Theatre by the Lake in Keswick is the perfect spot. 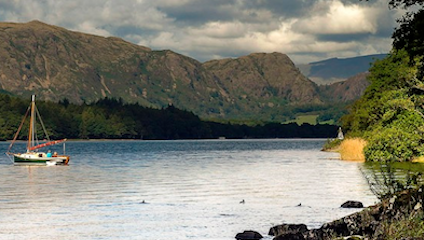 Just a short walk from the stunning Derwent Water, it has been named "the most beautifully located and friendly theatre in Britain" by the Independent. Quite a recent addition to the Lakes, the theatre opened in 1999 with a performance of Brandon Thomas’ Charley’s Aunt, and continues to present a range of cultural gems, from comedy such as Jeeves and Wooster, to high-brow Alan Bennet plays, cinema screenings and live music concerts. Not your average National Trust property, Allan Bank is rough and ready – only partially decorated after a destructive fire in 2011 – and welcomes you to explore by yourself, make yourself a cup of tea, paint, draw, or even bring a picnic to enjoy on the lawn. It has previously been the home of William Wordsworth – who moved here from Dove Cottage in 1808 – and later of the National Trust founder Canon Rawnsley. For literature lovers, it’s the perfect place to curl up in an armchair and watch red squirrels as you read by a roaring fire. We recommend picking a book up at the friendly Sam Reid Bookshop on Broadgate, Grasmere. Whilst not the height of intellectualism, Beatrix Potter’s Tale of Peter Rabbit is probably the first book that got a lot of literature lovers into reading. Her stories were all based upon elements of country life that she observed in her beloved Lake District, and a visit to the National Park wouldn’t be complete without paying homage to one of its defining writer-artists. Set at the heart of the chocolate box village of Hawkshead, in the 17th Century house where Potter’s husband formerly practiced as a solicitor, The Beatrix Potter Gallery is currently exhibiting “The Right Sort of Woman” which includes original artworks, letters and possessions that give an insight into Potter’s role in the community.